City of Edinburgh Council is one of the Capital’s largest organisations and is a supporter of the Edible Edinburgh Charter. “We deliver in the region of 3.5 million school meals annually. Good food is important to us; there are few things more important than helping children eat well because it allows them to grow well and learn well. 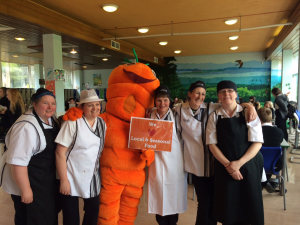 “We support the Edible Edinburgh charter because improving school meals and encouraging our young people to make healthier choices helps ensure a brighter future for Edinburgh’s young people and the health and wellbeing of our communities. Using local and more sustainable foods also supports our local economy and in the longer term helps the natural world to thrive. As well as sourcing healthy and sustainable food we aim to link up what is served in our schools with food education to help transform food culture in Edinburgh.